Audio Stereo Wireless Headphones. Shipped with USPS Priority Mail. Auvio PBT1000 Speaker. Condition: Tested and in Good working condition. Includes PBT1000 Speaker only. Requires 12V 2.5A Power AC Adapter. No other cables included. See photos for conditions. About This Item. (AuvioPBT4000 Portable Bluetooth Speaker - Gray. Portable Bluetooth Speaker. Up to 4 hours of battery life for portable operation. Guam, Puerto Rico, Virgin Islands, etc.). (Auvio 3301607 Concert Class Stereo Headphones - Navy. Auvio Concert Class Stereo Headphones - Navy. Guam, Puerto Rico, Virgin Islands, etc.). Warranty information can be found at the bottom of every product’s page. (Auvio 3301603 Color Headphones with Mic - Black. In-Line Mic. Warranty information can be found at the bottom of every product’s page. Guam, Puerto Rico, Virgin Islands, etc.). (Auvio PBT1000 Portable Bluetooth Speaker. Let your music move you with the AUVIO PBT1000 Bluetooth Portable Speaker. Warranty information can be found at the bottom of every product’s page. Guam, Puerto Rico, Virgin Islands, etc.). This is a new in the box item. This has a built in splitter in the cable. It has a 1/8" plug and a 3.9' ft flat cable. These earbuds are IPX3 water & weather resistant, and provide long distance wireless capabilities with less interference. Condition: The speaker has been tested and it's in great working condition. The sound from HBT2000W is rich and it can really fill up a room. Includes the speaker and the original 18V 2A Auvio AC adapter. Auvio 3301596 Color Earbuds with Microphone - Black. Auvio Color Earbuds with Microphone - Black. Slim inline microphone. Headphone Plug: Gold-plated 3.5mm. Size of Speaker (mm): 10mm. In-ear design reduces outside noise to improve audio quality. AUVIO Wireless Stereo Headphones Transmitter/Docking Station and Power Supply! AUVIO Wireless 33-2281Stereo Headphones Transmitter/Docking Station for AUVIO 3300281. 4.5 out of 5 stars - AUVIO Wireless Stereo Headphones Transmitter/Docking Station and Power Supply! 31 product ratings31 product ratings - AUVIO Wireless Stereo Headphones Transmitter/Docking Station and Power Supply! Auvio 1.5W Portable Bluetooth Speaker, Purple Color. Purple Auvio 1.5W Portable Bluetooth Speaker. Includes: Speaker Only. Condition: Excellent, working unit. About This Item. 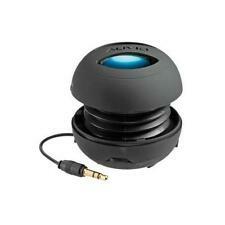 AUVIO docking speaker for ipod touch or iPhone, looks like new never been used. Auvio Wireless Stereo Headphones with Docking Station, 3301089. Free your music, and yourself, from the constraints of cables with these AUVIO Wireless Stereo Headphones. The 2.4GHz transmitter gives you a range of up to 115 feet, allowing you to listen just about anywhere in the house with no line of sight required. 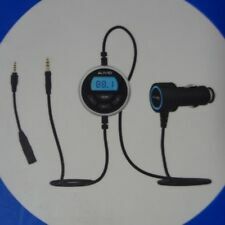 Model Number:Auvio Wireless FM Transmitter. Auvio bluetooth speaker. New never used. Please see pictures. 3.5mm Female to RCA Cable. Transmitter with Charging Cable and 3.5mm Audio Cable. Battery life: 10 hours. Signal-to-noise ratio: 50dB. Pair comes in good condition with minor wear due to previous use. Ear cushions are also in good condition with no rips. Please see attached pictures for quality and condition. If you have any questions, please ask before bidding. Thanks for looking! ***Pennsylvania buyers may be subject to 6% sales tax on taxable items. Please wait for invoice if purchasing from PA.
AUVIO Wireless Stereo Headphones & Docking Station - 153121. Condition is Used. Shipped with USPS Priority Mail. Auvio Over-the-Ear Headphones with Mic & Remote Black. Condition is Used. Includes black soft carrying case. Gold-plated 3.5mm stereo plug reduces static and interference, and can fit recessed headphone jacks. AuvioPBT500 Portable Bluetooth Speaker - White. Speakerphone for hands-free conversations via Bluetooth. Up to 8-hour battery life for portable operation. Works with any Bluetooth-enabled smartphone (including iOS & Android, tablet), laptop or MP3 player. Built in mic enables you to answer calls while listening to music. CHECK PICTURES FOR IPHONE & IPOD MODELS. 4-watt (2Wx2) output; Bass port enhances deep tones for robust sound. Speakerphone for hands-free conversations via Bluetooth. Warranty information can be found at the bottom of every product’s page. Auvio 3300089 Ear-Cup Foldable Headphones- Black. Auvio Ear-Cup Foldable Headphones- Black. Auvio Black Ear-cup Foldable Headphones provide great acoustic sound quality. With over-ear, sleek, easy-to-carry folding design and excellent sound. Auvio 4000592 Outbound Rugged Portable Bluetooth Speaker. Auvio Outbound Rugged Portable Bluetooth Speaker. It's tough, portable and can readily crank up the tunes on the mountain, at the beach or around the pool. 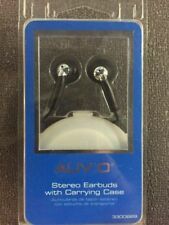 AUVIO " BLACK " STEREO EARBUDS WITH CARRYING CASE. "New Factory-Sealed". Great sound can be found with either smartphone or music player. Manageable cord lays flat. AUVIO 3Ft. 1/8" (3.5mm) to RCA(Phono) Stereo Audio Cable (Black) 4201001. Auvio product #4201001 -- 3ft / 0.91m length. 1/8" (3.5mm) stereo male plug to L/R RCA (phono) male plugs. Connects your portable audio device with a 1/8" (3.5mm) headphone jack to a stereo that has separate left/right RCA (phone) input jacks. Auvio Bluetooth Speaker Auvio Folding Headphones with Mic Listen in style with these AUVIO Folding Headphones. They feature dual 40mm drivers, a tangle-resistant woven cord and a built-in mic, so you can make and take calls when they're used with most smartphones. AUVIO Wireless Stereo Headphones 900MHz Transmitter Docking Adapter Cables 150ft. Shipped with USPS Priority Mail. See pictures for details or ask any questions. I TRY TO DESCRIBE MY PRODUCT THE BEST I CAN. Connects to the 3.5mm, headphones jack of your MP3 player or other audio device. Auvio Full Band FM Transmitter and Charger for iPod and iPhone 1200769 New! FM transmitter. Auto-scan feature searches with the push of a button for a clear frequency to help eliminate interference. AUVIO Wireless Stereo Headphones Transmitter/Docking Station Only..
AUVIO® Expanding Speaker White Listen to your music anywhere, from virtually any device, with this AUVIO Universal Portable Expanding Speaker. Colors Black Blue And White Sealed Fresh For You Each Has Its Own Carry Case. Used:An item that has been used previously. Hi all item other then listed. (Auvio 3301606 Color Headphones with Mic - Purple. Auvio Color Headphones with Mic. In-Line Mic. Warranty information can be found at the bottom of every product’s page. Guam, Puerto Rico, Virgin Islands, etc. ).